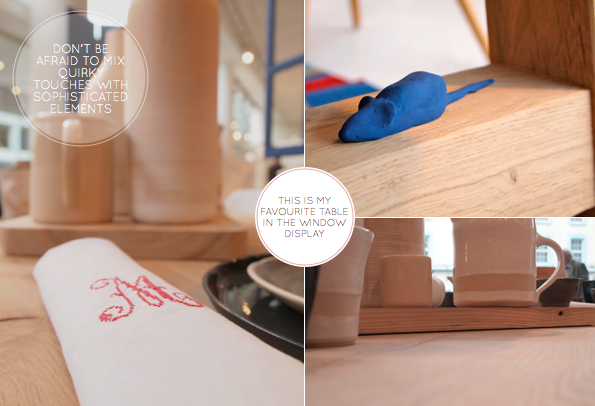 The Conran Shop are renowned for their creative window displays and this season certainly doesn't buckle the trend. 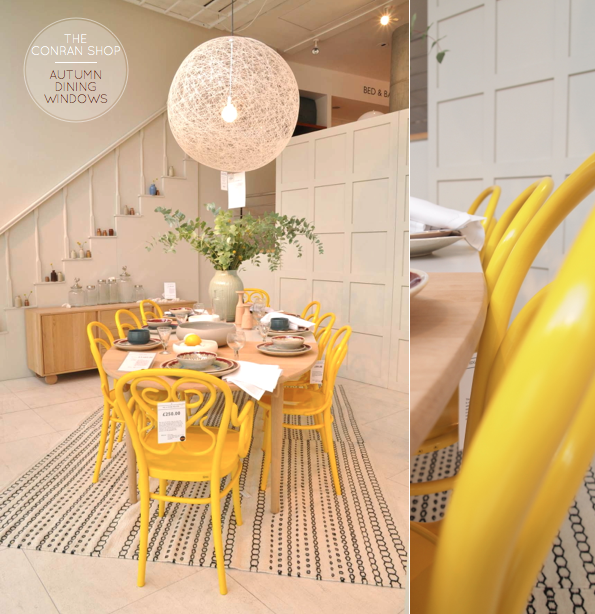 For the autumn season the brand's Head of Visual Merchandising Betsy Smith has delivered an inspired range of different dining room sets that nod to the colour palette of the season. 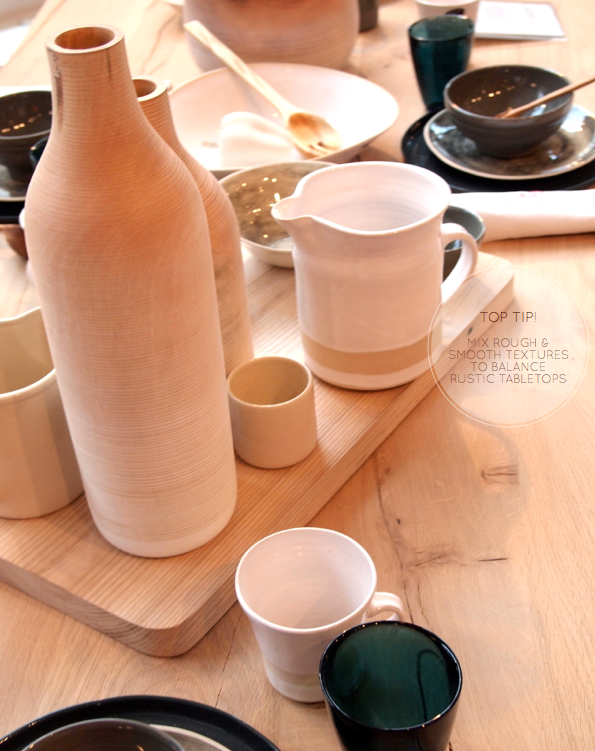 My favourite is tabletop number two, which details rustic, wooden textures, with a hint of gloss mixed in. 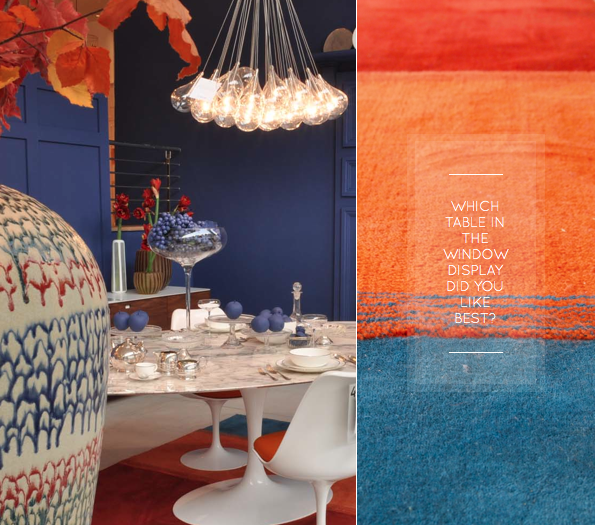 The burnt orange hues that dominate half of the window display are perfect for the autumnal weather; the dramatic blue in the Miss Haversham inspired scheme compliments this perfectly. Note opulent silver accents, grapes and clusters of well used candles, all of which emphasise the dramatic theme. 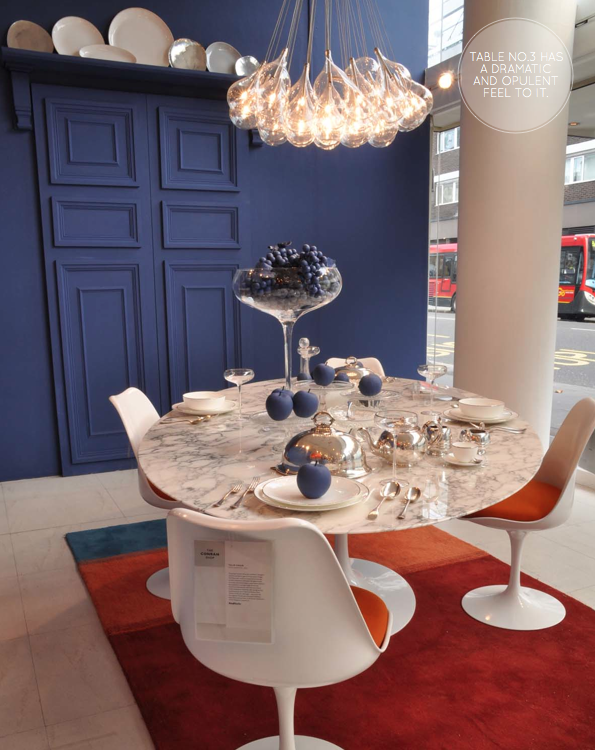 For me, the main inspiration from their window display is that you should take risks with your dining room: be bold with your colour choices and embrace a variety of textures when creating the tabletop. 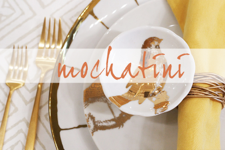 Don't be afraid to have some fun: mixing in quirkier pieces with your sophisticated serveware and linens will result in a more interesting tabletop. Which of the tables appeal to you? I simply love your blog! What a great spot for inspiration! 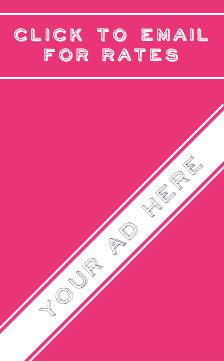 I just started up a new blog called Color Issue all about color inspiration...come on over and follow me! I love all three but the last one gets my vote as it has my favourite dining table and chairs. i'd go with the wooden table. it makes everything looks rustic and charming. and food always looks good against wood. It is a tough choice but I go for the first table top because I love the yellow hue of the chairs. Have a lovely day, Will! Love the rugs. I really want a rug for my living room to make an impact, this has just provided further inspiration! I do like that yellow charis - they're fantastic, so energetic! i love those bright yellow chairs in the first kitchen curation; the structure remind me a bit of my own dining set, curved backs, but the color is incredible. 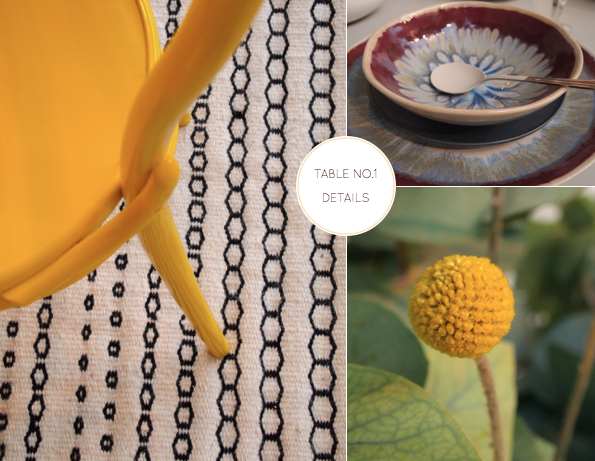 yellow happens to match my living area perfectly, so, naturally, i am now lusting. I really love table number two. The wood looks gorgeous. I love table no.2! 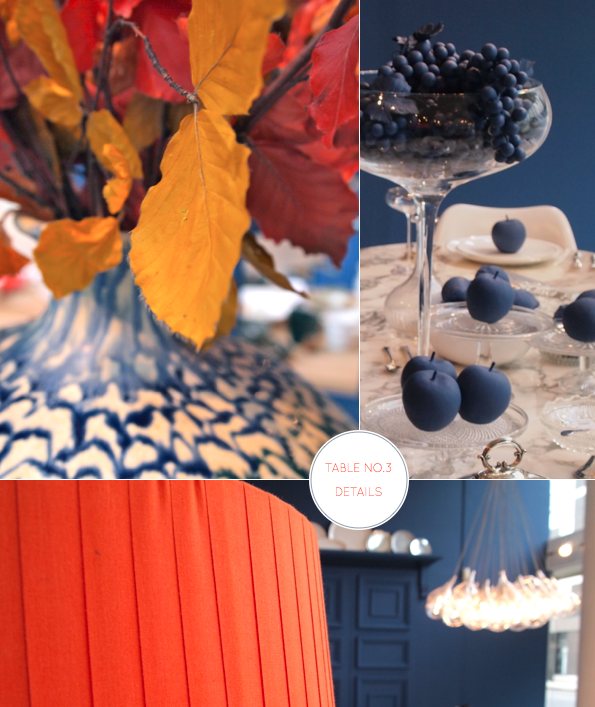 Love the light fixture and the contrast between the blues and reds are fantastic. Totally right up my alley! I also like the yellow chairs in table no.1! Oh yes! It looks like they are copying your "style"! All very lovely. And I must say that there are many similarities between design in Stockholm in and London. Same with fashion. Friendly, simple, edgy modern! Hugs to you Mr. Bright. All around a more cosy look for the fall. I love the blue and orange combination! Love your blog! Great content. Number two, also. I'll probably have a similar look in my new house in a few months. I already have the table, a bit more rustic done with reclaimed wood and for now, I want the same chairs. 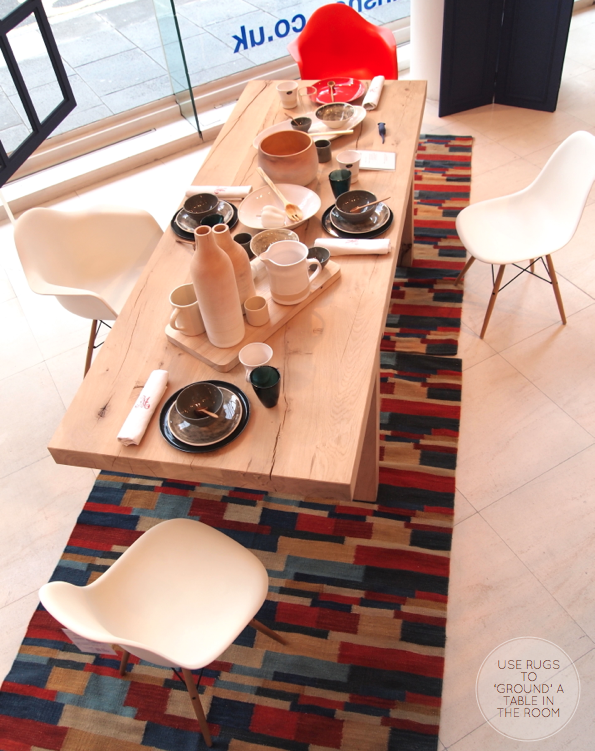 I really like what's on tabletop and the rug they used. Oh jeez, I would kill for that set of yellow thonet bentwoods...dream chairs! I need to go here! Like the round table! Love how the blue wall sets off those blue opaque apples!! Love the yellow chairs, but that hanging lamp of the second table is to die for! Plus the deep blue wall color really sets it off perfectly! i have been a follower of your blog ever since i read about it in a home and lifestyle magazine here in singapore. 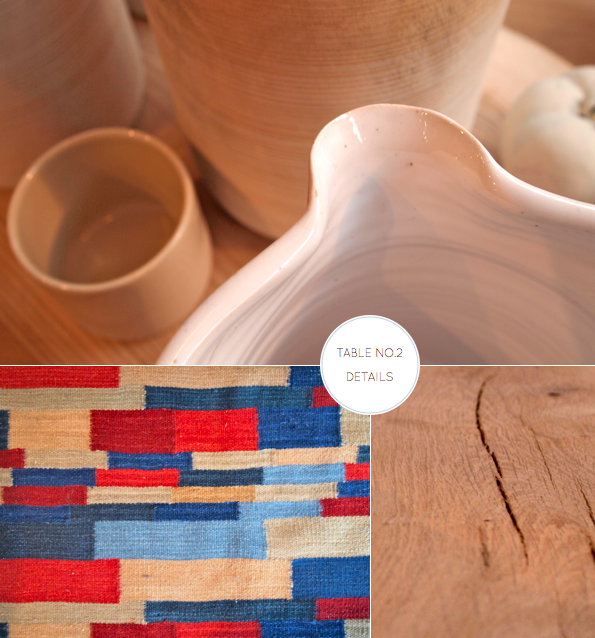 every post is a festivity of color and design. i particularly like the freshness of the yellow chairs here. i am still to put together a proper dining table for my place and i have earmarked this in my favorite posts by you!